I started her sometime last year and picked her back up again yesterday. I didn’t realize that I am almost done stitching her. Yeah!! When I finish the tail I will go back and add all of the outlining and beads. She is a design form Mirabilia. She is designed by my most favorite designer, Nora Corbett. And mermaids are my favorite. What I like about this design, is that she can be displayed vertically or horizontally. I plan on displaying her horizontally. I will be so happy to add her to my collection. Happy stitching. 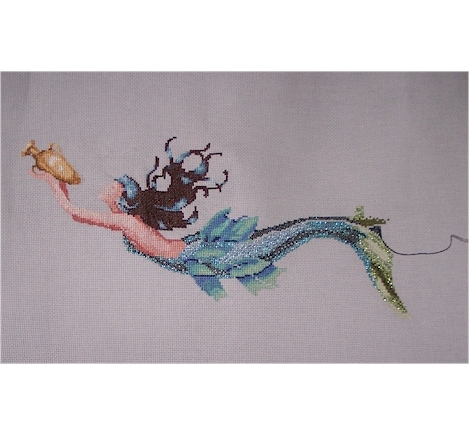 Previous Post My new stitching blog. She is gorgeous, Ginny! ~ I’m sure even more so in person! I would have a hard time deciding which way to hang her. I really like the way she’s getting ready to kiss that fish! Maybe she’s hoping he’ll turn into a MerMAN??? Love your new blog Ginny! And I love the mermaid. You are so tempting me to put this on my “to do” list.